Some old habits die hard. As the city's inhabitants are slowly turning into hordes of hungry undead, an ever-growing assembly of zombies is beginning to queue outside a wee little corner pub. Inside, a small group of patrons is forced to take up whatever arms are within reach to avoid the fate of ending up as someone else's snack. In the game, you have to keep the zombies from entering the pub, but rescue is on its way! Rally your fellow survivors and hold out. Be aware, however, that the rescuers might not take along everyone, so at some point you may have to decide whether to support your mates or to fight for yourself. 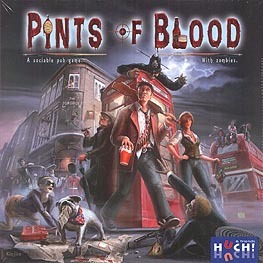 Pints of Blood is a semi-cooperative boardgame for 2-4 fearless night prowlers.